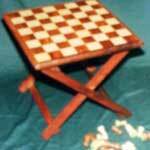 We offer a wide range of interesting Wooden Game that includes Wooden Chess Game, Wooden Game Knots N Crosses and so on. Our Wooden Board Game is manufactured from the superior quality wood that assures durability. Perfect finishing of our Wooden game make it highly demanding in the global markets. Our wooden game is available within the stipulated time frame at very affordable price. 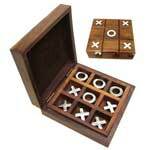 We are well reckoned as one of the supreme Wooden Game Knots N Crosses exporters based in India.